Two teams from the Faculty of Information and Communication Technology (FICT) secured third and fourth prizes at the 2017 F-Secure Inter-Varsity IT Security Competition held on 17 March 2017 at the Capri by Fraser @ Bangsar South in Kuala Lumpur. 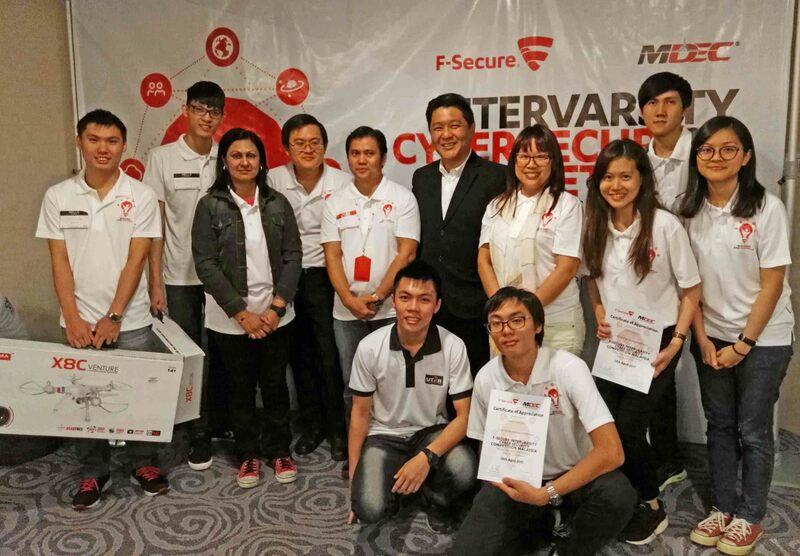 The 2017 F-Secure Inter-Varsity IT Security Competition is a brainchild of a long-standing collaboration between F-Secure and the Malaysia Digital Economy Corporation (MDEC). The competition was aimed at cultivating local talents and encouraging more undergraduates to venture into the field of IT security. It was also a good platform for Malaysian undergraduates to hone their skills and test their strengths and weaknesses as well as to raise their interest in the field of IT security. The second runner-up team, sudo rm-rf/, comprising FICT’s Computer Science students Joshua Chan Mun Wei, Lim Yun Kai and Lai Suk Ling, bagged home a unit of Syma X8C Venture with 2MP Wide Angle Camera 2.4G4CH RC Quadcopter. The second team, RasPi, also comprising Computer Science students Chow Jenn Pang, Lai Wing Khang and Khor Shee Khey, won the fourth prize and walked away with a package of Microsoft Office 365 Personal Subscription. The teams were led by the FICT lecturers Assoc Prof Dr Lau Phooi Yee, Dr Gan Ming Lee and Dr P. Vasaki. The 2017 F-Secure Inter-Varsity IT Security Competition was tremendously received by the University students with 126 teams from 24 higher learning institutions taking part in the competition. The grand final round featured a jeopardy-like course comprising different categories and levels that tested the participants’ hands-on skills and knowledge. All five teams which advanced to the final were required to complete a multistage challenge in a race of time. The annual F-Secure Inter-Varsity IT Security Competition was organised by F-Secure, a company which has developed as a global cybersecurity giant in recent years. The competition is aligned closely with the MDEC’s mission to advance Malaysia’s digital economy and raise interest and awareness amongst students in the field of cybersecurity, which is a crucial pillar of a thriving digital economy. The competition was opened to full-time IT undergraduate students enrolled in all Malaysian public and private universities. The competition tested the participants on the general knowledge of cybersecurity, news and current issues related to cyber threats, understanding security and targeted cyber-attacks, programming, debugging, understanding algorithms and coding in C/Python, predicting the output of code snippets, and digital forensics.